The Englert LeafGuard® gutter system is guaranteed not to clog with leaves, pine needles, or with other organic debris. Say goodbye to the dangerous and disgusting job of climbing ladders to clean out your gutters or the expense of hiring somebody else to do it. With your gutters running free and clear, you needn’t worry about water damage to your home. LeafGuard® Gutters are custom fit, attractively designed, durable, and they come in a variety of colors to fit various home designs. 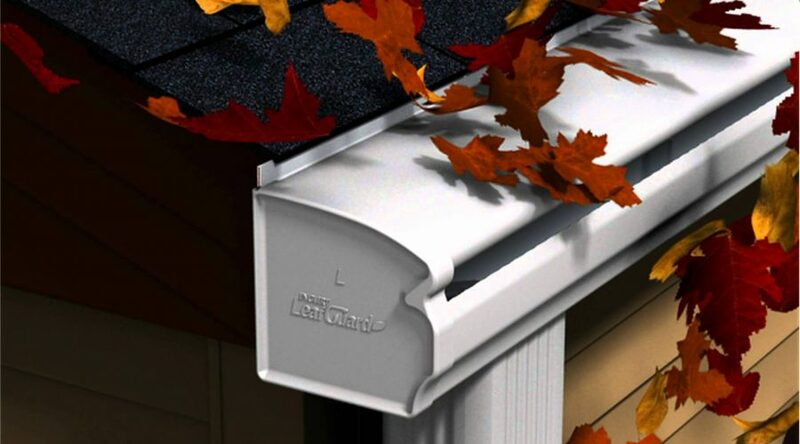 In many instances, Engert LeafGuard® costs no more than an add-on-gutter cover device. Contact us for a free, no-obligation estimate of your home! A complete gutter system that is custom cut and fitted to your home. A permanent gutter solution, not a hood, add-on or bulky cover. LeafGuard is the only seamless, one-piece leaf protection available. A patented system that’s built to stay clog-free. Keeps leaves, pine needles and other debris out. LeafGuard has helped hundreds of thousands of families eliminate clogged gutters. Aesthetically pleasing design that enhances the look of your home. Available in a variety of designer colors. Protected by ScratchGuard, the most durable paint finish on the market. Built with aluminum that is approximately 20% thicker than conventional gutters. Will never rust or deteriorate like galvanized steel gutters. Installed without driving nails or screws into your roof and without lifting your shingles. LeafGuard is screwed to the fascia board with internal hanging brackets, unlike conventional gutters attached with spikes that can come loose. Developed by Englert, one of the nation’s leading manufacturers of metal roofing and gutter products. LeafGuard has earned The Good Housekeeping Seal. Guaranteed not to clog – ever! Or we’ll clean your gutter for free*. ScratchGuard paint finish comes with a limited lifetime warranty and is guaranteed not to chip, peel or crack. Costs no more than an add-on gutter cover, but is of superior quality and longer lasting, making it a better value and a better investment. There is simply no comparison to the protection and peace of mind LeafGuard will give you. *Dealer Guaranteed for as long as you own your home. Other restrictions may apply.